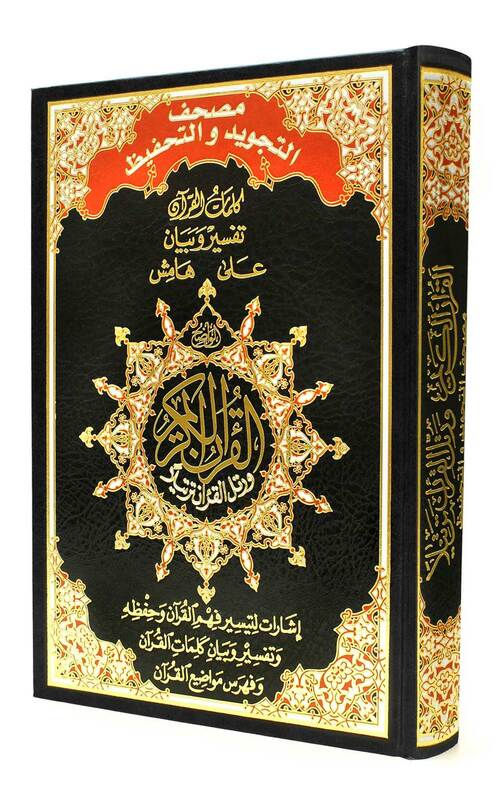 This Tajweed and memorization Quran comes with a nice hard cover. Memorization of the Quran is facilitated here by making the eyesight shares the mind in memorizing both the text and the subject in a very creative way..
On every page of this copy of the Tajweed Quran, subjects are distinguished by a different background colour, with brief overviews of the subject added on the margins. This helps in understanding the sequence of the Surah, and increases the awareness and the ability of linking the subjects to the texts for more enhanced memorization. The Tajweed and Memorization Quran script is the same as the other Tajweed Qur'ans script, except that this one has coloured blocks on verses in two colours, a kind of light yellow cream, and the other colour is light green. I like the purpose of using these coloured blocks, as it make the script so much enjoyable to the eyes when reading, and you don't get tired or bored while reading. The verses text has been made slighty smaller so that the Arabic words can fit around them. But don't worry at all, it's only a slight decrease of the text and it's not too much. I personally would wish if all the arabic around the verses would be removed, so that the verses text could be slightly larger as the other Tajweed Qur'ans are. This would improve the inside appearance of the Tajweed and Memorization Quran and make it much much nicer, smoother, and easier to read. If you can read Arabic then this Qur'an would benefit you even more, as the arabic around the verses, I think describe what the verses in yellow or light green are about or what topics they are about such as The Day of Judgement. Overall it's a great product, and if you are thinking of doing Hifz I recommend that you should buy it, and insh'allah it will make memorizing easier for you. I would love to give this 10/10 but I don't like the arabic around the verses, and also if the size of the text could be made slightly larger then I would love to give it a 10/10. I hope this this Review helps you to make your decision and gives you more information about this product and how the text and inside pages look like. I asked my self many times how different is this Quran? but when I saw the color backgrounds I understand the concept..It will not only help me to memorize Quran, it will let me understand it too.